For pricing view our hosting plans! Although no two web sites are exactly alike, there are several key questions that our clients ask about the hosting of their web site. We have developed this Hosting Specification Sheet to address these common concerns with detailed information about the technology used to bring you the fast, secure and high-quality web hosting products we offer at EPS Technologies. "What kind of equipment and connection do you use to host our site?" The best way to answer this question is to describe the data center that houses our web server. The data center features multi-redundant network architecture to ensure an ultra-fast, ultra-reliable network connection utilizing facilities-based network infrastructure. 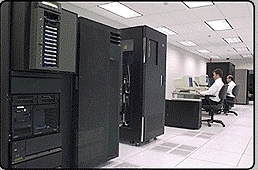 The data center uses a complex "ring" of fiber-optic cable known as a Synchronous Optical Network, or SONET, for connection to the Internet. 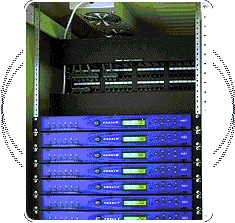 The multiple SONET rings act as virtually indestructible links in a chain that connect to high bandwidth optical data pipes, which tie the data center to the Internet using Cisco routing architecture and cutting edge protocols. These circuits provide OC-12 and OC-3 grade connectivity to the center's various Internet "backbone" providers. In short, our web server enjoys fully meshed high bandwidth pipes to multiple top-tier carriers, giving us one of the most stable and fastest connections to the backbone of the Internet. The network operations staff monitors the network and server infrastructure 24 hours, 7 days a week. Multiple teams of administrators are on site at all times. Multiple levels of security, including biometric palm scanner and access cards ensure all critical components are safe and sound. 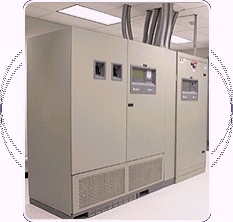 A sophisticated UPS system supported by our 1500 KVA diesel generator guarantees backup power in emergencies, an FM200 gas fire suppression system, raised floors for added ventilation, and a Leibert climate-controlled environment make our data center the model of security and efficiency. EPS Technologies has access to an expert staff of industry-certified technical support personnel, network engineers and administrators, who are on-hand 24hours a day, 7 days a week and 365 days a year to handle any support issues or questions. If critical components fail in the middle of the night, a qualified tech will be there to ensure hardware is replaced and tested in a matter of minutes. "How is the data on our site protected?" In addition to the disk mirroring that occurs on our IBM X-300 server, we have provided for a backup to all our clients' sites on a second web server, located in the Technology and Training Center of the Treasure Coast in Stuart, Florida. This backup server operates with the highest level of security possible (for a point of reference, this server is configured with security and encryption protocols that are 2 levels above what is required by banking institutions). In addition, the backup server is connected to a high-speed T-1 line and its power source is protected by both battery backup and generator. "How do you ensure that my web site is accessible in the event of a problem with your equipment or Internet connection?" This concern is being addressed first by the redundancy of our web server's connection to the backbone of the Internet and 24-hour monitoring. The public's access to our clients' web sites is virtually uninterruptible, and the server's mirrored hard drive, which automatically updates files as they are written, can replace a hard drive failure in minutes. In the unlikely event that our primary server ever fails, the backup server at the TDAT Center is ready to resolve the requests of your site visitors. EPS Technologies offers several different hosting packages to meet your requirement. View our hosting plans for pricing.